TORONTO — After leaking 17 goals in their last three home games, the Toronto Maple Leafs tightened up on defence in their return to the Scotiabank Arena on Saturday after a three-game absence. 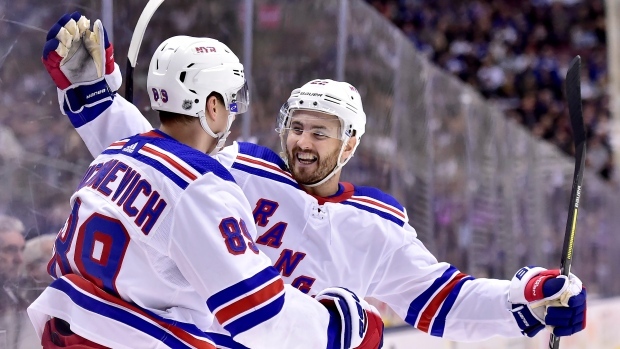 But another stellar performance by Rangers goaltender Alexandar Georgiev stymied their offence and Ryan Strome's overtime goal lifted New York to a 2-1 win over the Leafs, snapping a five-game losing streak. "Obviously our goalie was huge but we did a lot of good things too," said a relieved Rangers coach David Quinn. "Listen, it's one of the most dangerous teams in the league and I thought we did a real good job in a lot of areas and finally won an overtime game," he added. The Rangers (29-32-13) had lost the last five times — and 10 of the last 11 — the game had gone beyond regulation time. The winning goal came after the Leafs (44-25-6) had had a good scoring chance at one end. The puck went the other way and Frederik Andersen made a fine sprawling save on Boo Nieves on a two-on-one, only to have Nieves get the puck back to Strome who stuffed it in at 1:48. With another stellar performance in goal until finally beaten in the third period, Georgiev continued his mastery over the Maple Leafs. Toronto outshot the Rangers 45-28 Saturday and had a 104-58 edge in attempts at goal. "I have big respect for that team, obviously one of the top in the league," said Georgiev. "You know that you have to bring your best game to be able to (defeat) those guys." Trailing 1-0, the Leafs finally beat Georgiev at 8:33 of the third after a rush by Morgan Rielly opened up the Rangers defence and John Tavares fed Zach Hyman for his 19th of the season into a wide-open net. It was Toronto's 33rd shot on the night. Pavel Buchnevich had ended a scoreless deadlock 19 seconds into the third, beating Hyman to the puck in a mass of bodies in front of Andersen after a Brady Skjei shot from a bad angle produced a fat rebound. It was Buchnevich's 18th goal of the season. Toronto centre Auston Matthews directed 16 shots on goal but only four got through. Another four were blocked and eight missed the target. "(You) just keep going ... It's eventually going to go in. If it's not tonight, it's going to be tomorrow. If it's not tomorrow, it'll be the next game," Matthews said philosophically. "He had some great looks, really good looks," said Toronto coach Mike Babcock. "I thought we did a lot of good things tonight. I didn't think we got in our own way," said Babcock. "Obviously a disappointing way to end. I didn't think we were as good tonight as we've been in the last two games but I still thought we had lots of opportunity." Rielly led all players with 27 minutes 18 seconds of ice time. Georgiev came into Saturday's game with a 3.11 goals-against average and a .905 save percentage in 27 appearances this season. He had stopped 86 of 91 shots in his two previous career appearances against the Maple Leafs. It was his 11th start in the Rangers' last 22 games. Four of his last six starts have needed more than the regulation 60 minutes. Georgiev was busy from the get-go before a crowd of 19,251, forced to stop a dangerous wrist shot from Matthews on the Leafs first shot. Toronto outshot New York 6-1 to start.